EDITOR'S NOTE: Barbara Starr's conversation with Iraq war veterans, "Home from Iraq," can be seen throughout the day on CNN this Saturday, December 17. Watch the discussion about whether the war is over for these vets here, another conversation about the invisible wounds they suffer here, and a third piece about how they feel disconnected from Americans here. When we walked into the Veterans of Foreign Wars Post in Virginia, an elderly African American veteran of World War II came up to me and said "I take my hat off to these young folks today." At the age of 87, his war now fading from perhaps too much of the American conscience, his worry was not about himself, but about his young brothers in arms. Veterans of today's war are young enough to be his great grandchildren. On a cold rainy day, tapping his cane, he came out in the bad weather. He wanted to meet the Iraq veterans we had assembled. The Shakespeare "band of brothers" quote is tossed around all too frequently these days, but over the next two hours at that VFW hall, I would once again see that unbroken bond that exists among those who have gone to war for this country, whether it was 1941 or 2001. At this VFW post, five veterans of Iraq joined me to talk about the war just as the curtain is coming down after nearly nine years of conflict. All have suffered greatly from post traumatic stress. Not surprisingly, while they are deeply conflicted about the war, all five express concern about fellow veterans and why today's vets are still not getting all the help they need with health care and jobs. The veterans I spoke with make it clear that for them the war in Iraq is not over. "No its not over. We can't just leave the game on the court. We are struggling with things like epidemic levels of unemployment, suicide rate and because of that we have real casualties here just as we did in Iraq," says Ian Smith, who served in Iraq on tours in 2005 and 2007. John Kamin served two tours in Iraq between 2007 and 2010. He says he, and all veterans, must continue to "carry the burden" of the war. If they do not, "we are doing a disservice to those who stayed over there who gave all." All of the veterans talk about a sense of a disconnect from the American public about the war in Iraq. 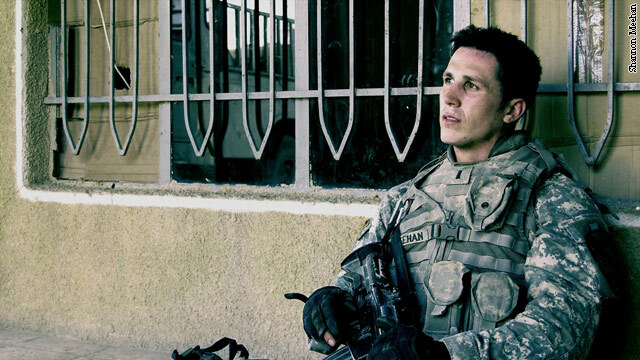 Shannon Meehan, who was in Iraq from 2006 to 2007, says that struggle has continued years after returning from the front lines when he deals with Americans trying to categorize him. "You're either the best go-getter type worker there is or you are the broken down veteran that is a day away from suicide with PTSD and all kinds of problems. It just seems like you come back and you are supposed to fit into one of these two extremes. It's a caricature, you must fit one of these or the other," says Meehan. "For myself, I am lost in the gray that is between those two," he says. "For me that leaves you feeling very isolated separated from society." For female veterans of Iraq it can be even worse. "I think that sense of isolation can be enhanced for female veterans because we are even more invisible, " says Kayla Williams, linguist with an intelligence unit of the Army during the initial invasion. "Because female veterans don't fit that stereotype of what a veteran looks like, who a veteran is, they can blend into the background even more." But what is so remarkable, even through the years of physical and emotional pain, is the sense these veterans say they have of serving something larger, and more significant than themselves. "I was so proud of the people I served with," says John. "At the end of the day it wasn't about the country, it was not about foreign policy, it wasn't even so much about winning any type of war as much as it was about doing what we could do for our particular area of operations and making sure we all got back." But what also strikes so deep is a continuing sense of responsibility to the Iraqi people. Even from veteran's like Luis Carlos Montalván, who deployed in 2003 and 2005 and now struggles with pain and post traumatic stress on a daily basis. Ask him if the war is over and he says absolutely not, not for veterans, and not for Iraqis. "The war is very much on going and its ongoing for the Iraqi people who are not really being spoken about." And as we concluded our chat with the young Iraq veterans, the elderly World War II veteran was still quietly watching us. Still wanting to thank these young men and women. The postings of miguel, Timothy, and Nick which direct the hate and blame toward the troops and veterans rather than the politicians and CEOs are a true and succinct portrayal of today's America, Generation X America.